Here's a little look at the book cover featuring my mural artwork from Don't Be Afraid of the Dark. 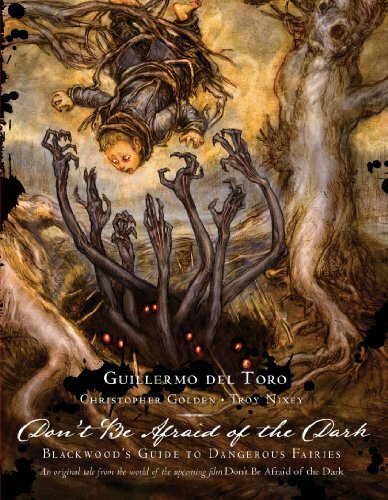 Guillermo Del Toro had it done as a completely separate accompanying story to the movie. Written by Christopher Golden, it contains some of my Blackwood drawings from the film and is fully illustrated by Troy Nixey. The book's got a really nice texture and feel, and I'm really thrilled by how the cover ended up. Both the book and the movie are out. Kieth, I love your work. I stumbled on it from somewhere, and now I can't get enough. And this blog is fantastic. Keep it up if you have the time. Also, I was psyched about DBAotD when I hear Del Toro was doing it, but now that I now you had input, I will make it a priority to watch. Sooo amazing! Questions: 1) what is the title of this mural? And 2) can I buy a print?? I juste discover your taff , good work . I can't wait to see the movie, unfortunately there is no set date for it to come out in new zealand.